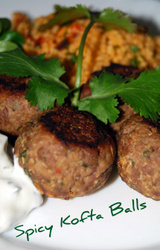 If you want an authentic kofta recipe that has all the flavours of the Moroccan Mediterranean then look no further. It's very quick and easy to prepare, and goes superbly well with its own special couscous that is also prepared in minutes. A great dish for any occasion. Evenly cover a large baking/roasting tray with the olive oil. Scoop out a little of the mixture and using your hands form into a ball approximately an inch in diameter and place on the oiled tray. Repeat this until you have used all of the mixture, making sure the balls are about an inch apart. Put on the middle shelf of a pre heated oven at 180ºc/375ºf for 30 minutes. While these are cooking, prepare the couscous. Put the couscous into bowl and add a little salt and pepper, then pour over the boiling water. Allow to stand for a few minutes while the grains absorb the water. In a medium fry pan heat the olive oil and saute the onion and red pepper over a medium heat until soft and golden. Take a fork and fluff up the couscous, then add the onion and red pepper mixture, pine nuts, lemon juice and zest, coriander and tomato puree. Mix well together and check seasoning. 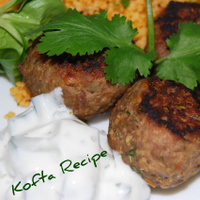 When the koftas are ready take them out of the oven.